The evolution of cloud infrastructures toward hybrid cloud models is inexorable, driven both by the requirement of greater IT agility and by financial pressures. A study by 451 Research reveals that the greatest barrier to cloud migrations is the twin challenges of security and compliance in the hybrid cloud space. Organizations are struggling with practical considerations, which can prevent them from achieving some of the most important and valuable benefits of hybrid cloud deployments. 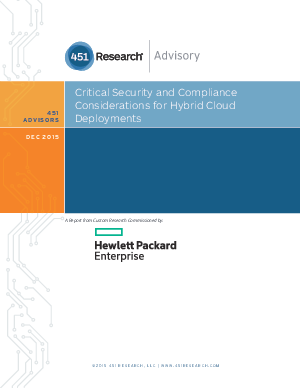 This report details a number of steps that organizations can take to set themselves squarely on a path to a secure and compliant hybrid cloud.